Who invented the Parachute? Leonardo da Vinci: Leonardo da Vinci (1452-1519), the great Renaissance genius, artist and inventor conceptualized, produced plans and made sketches of a parachute in his notebook in 1483, but his invention was never implemented. Who pioneered the Parachute? Fausto Veranzio: The first implemented parachute, based on the design of Leonardo da Vinci, was created by the Croatian inventor Fausto Veranzio (c.1551 – 1617) who tested the parachute by jumping from the bell tower of St Mark's Basilica in Venice in 1617.
Who pioneered the Parachute? Louis-Sebastian Lenormand: The name of the person most often credited with pioneering the Parachute, and for providing the name of the device, is Louis-Sebastian Lenormand (1757 - 1837). Louis-Sebastian Lenormand demonstrated the Parachute on December 26, 1783 when he jumped from the medieval tower (Tour de la Babotte) used as the Montpellier observatory in southern France. Definition of the Parachute: The Parachute is defined as an un-powered device, shaped like an umbrella or canopy, that is made out of light, strong cloth such as silk or nylon, attached by cords to a harness. It is designed to slow the motion of a person or an object through an atmosphere by creating drag. Fact 1: Who invented the Parachute? The Parachute was invented by Leonardo da Vinci in 1483 during the Renaissance Period (1300 to 1700's). Fact 2: Who invented the Parachute? Prior to the invention of the Parachute in 1483, there was an ancient Chinese legend that the father of the legendary Emperor Shun (reigned 2233 BC-2184 BC), Gu Sou wanted to kill his son by forcing Shun to jump top of a high roof. The legend tells that Shun held two large bamboo hats to escape from the roof and land on the ground safely. The principle of the parachute was therefore first demonstrated using bamboo hats to increase air resistance to reduce the falling speed. Fact 3: Who invented the Parachute? The inventor who conceptualized the Parachute, Leonardo da Vinci, was born on April 15, 1452 in Vinci, Tuscany, Italy and died on December 1837. Fact 4: Who invented the Parachute? Leonardo da Vinci was a true genius of the Renaissance Era. His talents seemed to have no end. He achieved great fame as an artist, a sculptor, polymath, architect, engineer and inventor. Fact 5: Who invented the Parachute? Leonardo da Vinci achieved great fame as the master painter who created the Virgin of the Rocks (1486), The Last Supper (1498), the Mona Lisa (1517) *** The Last Supper, 1498 and the Vitruvian Man. Fact 6: Who invented the Parachute? Although Leonardo da Vinci is most famous for his amazing paintings he was also a prolific inventor who used his artistic talents to produce sketches of many inventive ideas that a submarine, a helicopter, an airplane, a giant crossbow, a bicycle, a treadmill machine gun and a parachute. This article focuses on his life as an inventor and his invention of the Parachute. Fact 7: Who invented the Parachute? Leonardo da Vinci was born on April 15, 1452 in Vinci, Tuscany, Italy. He was illegitimate. His father was a landowner and a wealthy man called Messer Piero Fruosino di Antonio da Vinci. His mother was a peasant woman named Caterina. The early years of Leonardo da Vinci's life were spent with his mother. When he was five years old he was sent to live with his father’s family, including his father, grandparents and his Uncle Francesco, where he was treated as a legitimate son. Fact 8: Who invented the Parachute? Leonardo da Vinci received an excellent education at home including mathematics and geometry and Latin but he excelled and had a passion for painting. At the age of 15 years old, his father apprenticed him to the Renaissance artist Andrea del Verrocchio. Fact 9: Who invented the Parachute? Leonardo da Vinci established his own workshop in 1472. Ten years later, in 1482, Leonardo da Vinci 1482 moved to Milan to work in the service of Ludovico Sforza, the Duke of Milan where he gained the title of "painter and engineer of the duke". Fact 10: Who invented the Parachute? In January 1500 Leonardo da Vinci left Milan and moved to Venice where he entered the service of Cesare Borgia as "senior military architect and general engineer". Fact 11: Who invented the Parachute? During the time Leonardo da Vinci worked for the Duke of Milan and Cesare Borgia he made various inventions relating to machines of war and focused his mind on other inventions relating to the defence of the cities of his patron and also weapons of attack. Fact 12: Who invented the Parachute? It was during this period of invention that Leonardo da Vinci had the idea of creating a Parachute and sketched his concept in his notebook in 1483, just a tear after entering the service of the Duke of Milan. Fact 13: Who invented the Parachute? His idea of creating a device that is now known as a Parachute was in order to provide an escape device to allow people to jump from burning buildings. There was always the possibility that Milan would be subject to siege warfare when the city might be subjected to fire caused by Medieval canon fire. There was also a concern that wooden buildings would spread fire through the city. Fact 14: Who invented the Parachute? The sketch of Leonardo da Vinci's invention of the Parachute was accompanied by the following description: "If a man have a tent made of linen of which the apertures (openings) have all been stopped up, and it be twelve braccia [an old Italian unit of length of about 23 feet] across and twelve in depth, he will be able to throw himself down from any great height without suffering any injury." Fact 15: Who invented the Parachute? The invention of the Parachute by Leonardo da Vinci differs from the modern parachute design in that the canopy was triangular rather than rounded. The contraption did not include any form of safety harness, although such a device would certainly been added if the Parachute had in fact been tested on high structures such as towers, trees or cliffs. Fact 16: Who invented the Parachute? There is no written evidence that such experiments were made on Leonardo da Vinci's parachute or whether his device actually worked. Many critics of his parachute design later questioned the hefty weight of the device and whether it would actually have enough air resistance to float. Fact 17: Who invented the Parachute? Leonardo da Vinci died in Cloux, France at Cloux on May 2nd, 1519 and was buried in the Amboise palace church of Saint-Florentin. Fact 18: Who invented the Parachute? The invention of the Parachute was not lost due to Leonardo da Vinci's notebooks and other inventors became intrigued by his idea. The Croatian inventor Fausto Veranzio tested the parachute by jumping from the bell tower of St Mark's Basilica in Venice in 1617. He broke his leg in the attempt but nether-the-less- survived the fall. Fact 19: Who invented the Parachute? The invention of the Parachute came under the spotlight again after Joseph and Jacques Montgolfier invented the Hot Air Balloon in 1783. Louis-Sebastian Lenormand (1757 - 1837) demonstrated the Parachute on December 26, 1783 when, watched by Joseph Montgolfier, he jumped from the medieval tower in southern France. From the time of Louis-Sebastian Lenormand's experiment people began to consider the safety aspects of such a risky form of transportation. Fact 20: Who invented the Parachute? The first emergency use of a parachute was made by Jean-Pierre [François] Blanchard (1753-1809) in 1785 after the hot air balloon he was in exploded. Fact 21: Who invented the Parachute? Jean-Pierre Blanchard went on to make parachutes from folded silk, rather than linen, to take advantage of the strength and light weight of silk. Fact 22: Who invented the Parachute? Jean-Pierre Blanchard was responsible for giving the parachute its name in 1784. The word "parachute" derives from para meaning "defense against" combined with the French word 'chute' meaning "a fall". 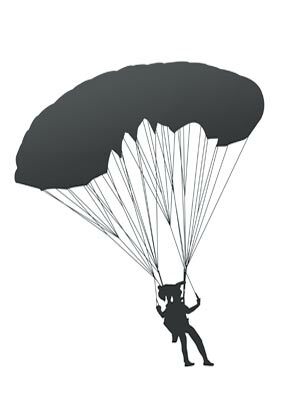 Translated from French the word parachute means "that which protects against a fall". Fact 23: Who invented the Parachute? In 1797 the French aeronaut André Garnerin made the first jump using a silk parachute without a rigid frame. Garnerin also went on to invented the vented parachute, which improved the stability of the fall by dramatically reducing canopy oscillations. Fact 24: Who invented the Parachute? The next important contribution to the design of the parachute systems was in 1887 when Captain Thomas Scott Baldwin (1854 – 1923) developed a parachute harness by which rope straps were used to hold the parachute to the body. Fact 25: Who invented the Parachute? The idea of folding or packing a parachute in a canvas knapsack-like container was developed by Paul Letteman and Kathchen Paulus in 1890. The lines and canopy of the parachute were folded inside the knapsack bag which was closed with breakcord and then attached to the balloon, used for ascent. As the aeronaut fell away the breakcord would break and release the stowed parachute. Fact 26: Who invented the Parachute? In 1903 the Wright Brothers invented the first powered, sustained, and controlled flight of an airplane. In 1911, Grant Morton made the first parachute jump from an airplane using a silk parachute folded in his arms which he threw out as he left the plane. Fact 27: Who invented the Parachute? In 1935 Wallace Carothers invented Nylon, the world's first totally synthetic textile fiber. When WW2 (1939 - 1945) broke out natural materials, including silk, were commandeered to meet military and nylon served as a substitute for the canopies of silk parachutes. Fact 28: Who invented the Parachute? Despite the years, the parachute conceptualized by Leonardo da Vinci in 1483 was still remembered. In 2000 British skydiver called Adrian Nicholas (1962 – 2005) constructed a parachute based completely on Leonardo Da Vinci's sketches and tested it. Adrian Nicholas was warned that the canvas and wood contraption would never fly. He ignored the warnings and on June 26, 2000 Leonardo da Vinci’s design worked as intended - nearly 500 years after it was originally invented. Leonardo Da Vinci was proved right and Adrian Nichols even commented that the device provided a smoother ride than modern parachutes.